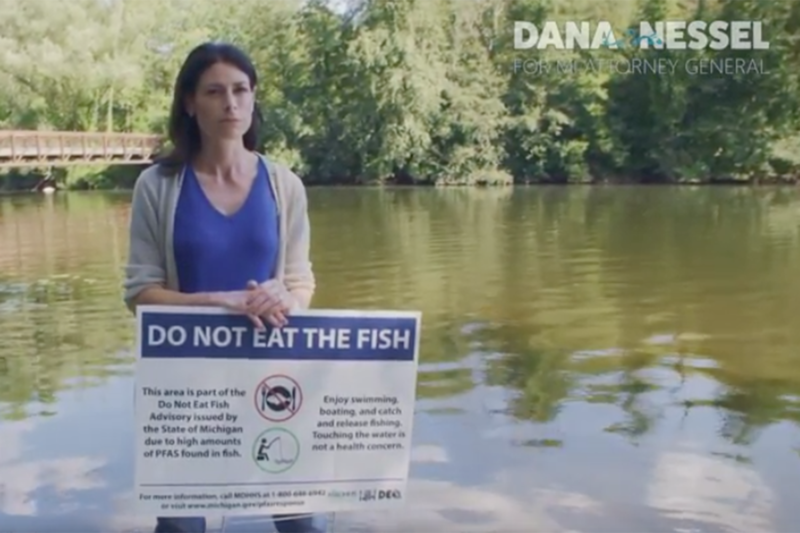 Dana Nessel, the Democratic candidate for attorney general, released an ad last week blasting Republicans for their response to the chemical PFAS threat. The ad includes some whoppers and distortions that spread misinformation about a serious issue. Dana Nessel, the Democratic nominee for Michigan attorney general, claims state Republicans are unwilling to address the emerging threat of water contamination from industrial chemicals known as PFAS. Nessel makes her case in an ad Truth Squad rates as foul because it grossly inflates the number of sites that have tested positive for the hazardous chemicals while grossly minimizing Michigan’s efforts to tackle the problem. Released last week, the digital ad features Nessel discussing the dangers of PFAS, chemicals linked to a litany of health problems that are increasingly being detected in Michigan waters. The backdrop: The Huron River, where state officials in August warned against eating fish due to high levels of PFAS. “We haven’t had anyone in the state Legislature, we haven’t had anyone in the governor’s office, and we certainly haven’t had anyone in the office of Michigan attorney general who has been willing to really do anything about this issue,” she states. No doubt, PFAS is a serious issue, as Truth Squad already pointed out when Attorney General Bill Schuette was unfairly slammed for not doing more to help those whose water supplies were contaminated. And there’s plenty of room to debate about whether Michigan should have acted more quickly and aggressively to address it. But Nessel’s ad dangerously spreads misinformation about one of the top threats to Michigan’s environment. Her first falsehood is a whopper: She claims the state has 11,000 confirmed PFAS-tainted sites. In fact, the number far less, although the tally is far from complete. The Michigan Department of Environmental Quality is testing all public water supplies and at schools with private wells for PFAS. So far, 51 of the 770-plus sample results tested positive for any amount of the two most studied types of PFAS state officials looked for: PFOA (perfluorooctanoic acid) and PFOS (perfluorooctane sulfonate), according to MDEQ data. And just six — all in the Kalamazoo County town of Parchment, which recently switched its water supply — tested above the U.S. EPA health advisory level for the chemicals. Before testing statewide, officials had detected some level of PFAS in more than a dozen communities, some of which had contamination at multiple sites. No doubt, anything more than zero is a problem – but the tally so far is well shy of the number cited by Nessel. That number refers to as many as 11,300 fire stations, landfills, airports and other sites that may have used products laced with the chemical, according to MDEQ maps of “potential PFAS sites” described in the news story. "Those maps were really designed to be very, very conservative — just to identify worthwhile places to look and consider," an MDEQ spokesman was quoted as saying in the Detroit Free Press story. The ad’s other argument – that state government has done little to nothing about PFAS – is more nuanced but misleading. Fisher pointed to reports that a MEDQ Superfund specialist co-authored an internal report in 2012 that cited concerns about PFAS and recommended action, but was mostly ignored until 2017. The Nessel campaign, in response to Truth Squad, scolded the Legislature for not advancing House Bill 5898 to hike fees to fund water system fixes and raise money to address PFAS and other contamination threats; and faulted Attorney General Bill Schuette for failing to sue chemical giant 3M over PFAS contamination, despite a request by Gov. Rick Snyder to do so. But the campaign neglects to mention Snyder (who Nessel accused of inaction) is aggressively promoting legislation to fund water system improvements, and Schuette’s office is preparing to sue 3M, according to a governor spokesman. MDEQ’s decision to set cleanup criteria for PFAS — a legal standard allowing Michigan to take action against polluters in court. Yes, many environmentalists and residents view state leaders’ actions as too limited and too late. That is a fair criticism and worthy of rigorous debate. But Nessel’s reckless exaggeration of the threat and blanket claims that state leaders are doing nothing are demonstrably false and earn her ad a rating of foul. Truth be told we are a far cry from understanding the impacts of the PFAS problem. For too long the MDEQ has been pushed back and forth between Republican and Democratic ideology - to the point where they’re overly cautious or downplay discovered contaminations. The MDEQ has yet to even put a dent in testing fish in our lakes and rivers for these long lasting chemicals. What will happen to our tourist industry when word gets out that many of the fish in Michigan are no longer edible? Now with a MDEQ oversight board comprised of those who have a vested interest in eliminating or severely diluting environmental regulations, our state will continue to suffer. Future politicians of any variety must grasp the long term consequences of putting their collective heads in the sand and come to terms with both climate change and unchecked commercial pollution. Using the economy as the most significant variable to bolster a war on environmental regulations and bridling the MDEQ will only continue to metastasize the cancer that runs in our lakes and rivers from past ideologies. Although Nessel may be exaggerating some of her claims concerning the actual numbers, she is right in bringing to light that not enough is being done to stop the all to frequent pollution issues popping up around the state. As such, a new way of thinking is needed from future politicians and others responsible for influencing policy. The old way is no longer a viable strategy. You’re really limiting this, why I’m not sure. The PFAS levels just below the Rogue River Dam in Rockford, just downstream from Wolverines’s old tannery, from which wastewater was dumped directly into the river for years, is astoundingly high. Plainfield Townships was pulling contaminated water from a spot in the Grand River right next to a spot from which PFAS in the water table drained into the river, and this water was pumped to thousands of homes. What the levels were when decades ago are unknown now, but there are high rates of thyroid problems in people who lived in the township for over decades, like a good friend of mine did through her childhood. Are the residences, which pumped contaminated water for so long, not considered amongst those sites? I think that in this case you are holding to a much too discriminating definition of “contaminated sites”. Thanks so much for your comment. We agree that PFAS is a serious issue, as the Truth Squad notes. And there is plenty of room for debate about the appropriateness of the state's response. We would have no quarrel if Nessel's ad had stuck to those lines of criticism. But claiming there are 10,000 "confirmed contaminations" when there are fewer than 100 and suggesting that "nothing" is being done are simply untrue. The 'Truth Squad' is misleading the readers, "No doubt, anything more than zero is a problem". When we are talking about parts per trillion does the 'Truth Squad' have the toxicological expertise to claim that a PFOA or PFOS molecule will cause harm, because when talking about 'zero' that is what the practical application of sub part per trillion level is. When talking about chemical analysis and certifiable testing results at the subpart per trillion level 'zero' is no longer an credible number and to suggest that it is misleads those without the appreciation of toxicology and how the body reacts to and processes chemicals on the individual molecular level. I would encourage the 'Truth Squad' to stay within their area of expertise and not make claims they can't validate. I say this after being schooled many years ago by an analytical chemists of some international report and by a toxicologist of noted expertise. Duane, I see nothing wrong with your comment in terms of accuracy -- indeed, "zero" as a meaningful index doesn't apply in this case -- but you never connect the Truth Squad's inaccuracy with any difference in conclusion. Instead, you segue into an ad hominem attack, suggesting that this lack of knowledge makes them ineligible to comment on a political inaccuracy. Last I checked, the knowledge required to comment on a political inaccuracy is simply knowing the statement made, and knowing how it is inaccurate. As far as the "zero" issue is concerned, let's grant your point. Indeed, once levels fall below a certain amount, it wouldn't flag indicators of concern. So let's revise the Truth Squad's statement to read: "No doubt, any significant levels of contamination are a problem." Seeing as you decided to judge their entire background and adequacy based on a sentence, does the revision of that sentence make you reconsider? My guess is that you went into this from a certain perspective, and decided to jump on the first point that could be used to back it. I'm not faulting that approach, because it seems all political activists do it. I'm simply saying you could have chosen better tactically. Nessel's claim that there is a "health epidemic" as a result of PFAS contamination is also a falsehood. There is no public health and medical data showing that there is any epidemic of PFAS-caused health effects in the State of Michigan.